Although we primarily focus our online selling efforts on Ireland, the power of the Internet means that we can be found by customers from many different countries. In the last few months we have sold to the UK, France, the Netherlands, Belgium, Germany, Denmark, the USA and Canada. We have also received a number of orders from a few different customers in Russia (all in Moscow). 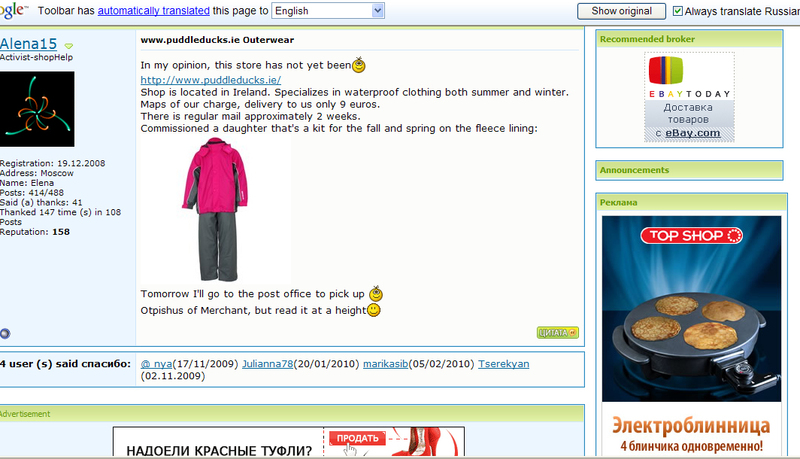 We seem to have a big fan in Russia who posts about us on a Russian shopping forum. and we regularly get traffic from the forum posts back to our website. I have to rely on the Google toolbar translation service to see what they are saying about us. Accepting that a lot of the meaning gets “lost in translation”, here are a few of the quotes about PuddleDucks on the forum. liked the surprise was the sweater (ordered as a gift to the village district.) had a button with a picture of a tractor and he growls and pants in all keys))) Fleece myagchyayshy, my child is fussy (he agrees to wear clothes selectively) got no calls. Vasche I love this story, it is warm, lightweight, easy to wash, dries quickly, presentation for a long time to lose. In blue sweaters lightning in green. sweater wide neck, his head is not stuck. I know it does not all make complete sense but I think we can safely say that the Russian customers like their PuddleDucks gear. And we’re delighted that we are reaching satisfied customers – not just in Ireland but all over the World too. There’s a link to the Russian shopping forum here. Привет. Мы очень счастливы иметь клиентов из России. Пожалуйста пошлите по электронной почте нам в info@puddleducks, если Вы имеете какие-нибудь вопросы.